People that don't like Stravinsky's Le Sacre du Printemps are like people that don't like The Beatles: liars. In this centennial year of that landmark piece's premiere at the Théatre des Champs-Élysées, the Chicago-based Joffrey Ballet's 13-city touring show is arguably the closest one will get to the original production. The version that Joffrey presented in 1987 was based on Millicent Hodson's reconstruction of Nijinski's original choreography, as well as Nicholas Roerich's original designs. This version is based on that prior Joffrey production, and never has a restaging of a restaging seemed so innately, inevitably appropriate. This timely piece was presented at the Music Center last weekend in repertoire with two other revolving pieces. When I saw it on February 1, those pieces were Son of Chamber Symphony and After the Rain, choreographed by Stanton Welch and Christopher Wheeldon respectively. The alternate program, which I didn't see, included William Forsythe's In the Middle, Somewhat Elevated and Edwaard Liang's Age of Innocence. Son of Chamber Symphony was a solid display of elegance and athleticism. It offered itself for narrative interpretation, but thwarted any definite attempts to impose on the self-contained statement within. It began with a male ensemble and a solo ballerina, moving into a pas de deux for the second movement, and replaced the male ensemble with a female one for the third movement. The backdrop lighting reminded me of stylized studio loft windows, changing colors for each movement like sunlight giving way to night. Knowing that Adams' s surprisingly cantankerous score was was originally commissioned and premiered by the Mark Morris Dance Group, I wondered why Stanton Welch's version was chosen by Joffrey. After the Rain, featuring music by Arvo Pärt, was second. It is essentially two pieces dovetailed together: an ensemble piece set to Ludus from Tabula Rasa, and a pas de deux set to Spiegel Im Spiegel. Part I was stark grey from floor to ceiling, including the dancers' costumes. While the artistry with which the dancers executed their movements was exceptional, I was distracted by the lack of interaction with the music. The musical gestures of Ludus are anything but subtle, and the finely nuanced dance did little to acknowledged these broad sonic strokes. That independence of elements must be an artistic choice, but seemed out of context - at least until the non-sequitur transition to the pas de deux. As the three duos completed their final gestures, the duo emerged onstage. Their vibrant colors and display were a sharp contrast to the monochrome grey of part I. Many people found part II to be their favorite piece on the program. An elegiac display of grace and skill, this piece portrayed an unapologetic sincerity that is only fathomable in an artform such as ballet. Every time I have heard Spiegel Im Spiegel live, the audience has broken into an almost comical sea of coughing - so much so that it now feels like an integral part of the piece. Friday's performance was no exception, though the audience participation did nothing to detract from the unabashed splendor of the piece. However, while the pas de deux was extraordinary, and Spiegel Im Spiegel was a perfect complement to it, I found myself wondering why Wheeldon ignored Silentium, part two of Tabula Rasa. After a second intermission, the Rite began. 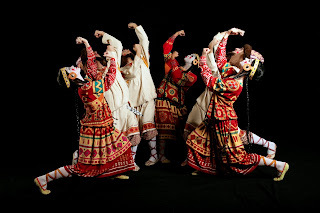 Involving less pointing and more stomping, Hodson's reconstruction of Nijinsky's choreography presented a stark contrast to the finely crafted ballet that preceded it. When I was in my teens, I would watch the 1987 production on a VHS of The Search of Nijinsky's Rite of Spring. If you have seen that video, then you will not be particularly surprised by what you see in this year's model. However, the goal of presenting Le Sacre du Printemps is not to subvert expectations, but to celebrate and honor the original piece that left such a scar on the world. Seeing that same piece live was an exhilerating treat, and Joffrey did a fine job in presenting it. The full ensemble scenes were wonderfully over-stimulating, with every inch of the stage coalescing into colorful joints of some particularly unruly organism. My favorite moment was when the chosen girl, having stood perfectly still for quite some time, finally launched into her sacrificial solo dance. There is something haunting about those strange, angular leaps and gestures, particularly after the stillness that precedes them. Like so many other composers of the last century, my first orchestration "lessons" came from pouring over the score of the Rite. From the moment the iconic bassoon opening floats in, you know exactly what you are in for. While the ensemble seemed a little pared down from Stravinsky's original orchestration, the power of the music still shone through. There was even a musical revelation of the evening, though it didn't come from the pit. The stomps, claps, thigh slaps, and foot slides of the dancers added a delightfully surprising texture that one would never get from any standard orchestral performance, recorded or live. 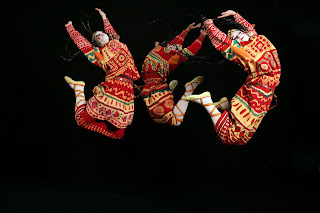 Were those part of Nijinsky's original choreography, or were they inferred by Hodson? I am dying to know.